Live music, good friends and quality food are the key ingredients to a perfect weekend. Head to one of these spots near The Daley to cook up yours. Bethesda Blues & Jazz Club is a gorgeous art deco style venue where you can see everything from a Prince tribute band to comedy shows, DJs and classic jazz sets. Grab a bite of jerk chicken or a sautéed jumbo crab cake from the menu. Bethesda Blues & Jazz Supper Club is a 23 minute drive or 30 minute metro ride from The Daley. The Mansion at Strathmore hosts a plethora of community events. Here, you can catch a film drive-in style, enroll the kids in art camp or take in a live music show from a local musician. The Mansion at Strathmore is a 20 minute drive or 27 minute metro ride from The Daley. Finnegan’s Wake Irish Pub is the perfect place to share a cold beer with friends. Head here on Wednesdays and weekends to hear some live music. Finnegan’s Wake is an 11 minute drive from The Daley. 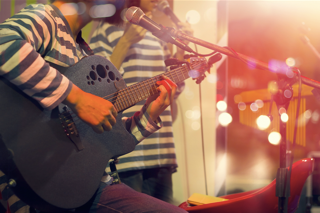 Which of these local live music venues will you visit first? Contact us today for more information on life at The Daley or to schedule a visit.